Many homeowners install fireplace inserts to extend the life and significantly increase the overall efficiency of their open wood burning fireplaces. All Pro Chimney installs fireplace inserts in homes across the Washington DC Metro Area and Greater Baltimore Region. Our team of chimney professionals meet with homeowners and help through the process of choosing between wood-burning, pellet stove and gas fireplace inserts. Fireplace inserts are metal boxes that can be installed in existing masonry fireplaces to convert them into energy efficient gas, wood-burning or pellet stoves. Gas is the best option for those who view energy efficiency and ease of use as their top priority. The cost of gas fuel is higher than the relatively cheap cost of wood or pellets. However, some of that increased cost is countered by increased energy efficiency. Easy to use. They start as soon as you flip the switch. No carrying or storing wood. Cleaner, no ash or creosote deposits are created. Requires less maintenance than other fireplace insert options. More precise heat level controls allow zone heating for specific areas. ​​ Wood burning fireplace inserts burn real wood in a closed case resulting in increased energy efficiency. Wood burning fireplace inserts are the best option for those who want to improve efficiently but are willing to sacrifice some level of energy efficiency to keep the look of real wood burning. ​​ Pellet stoves burn pellets that are comprised of compressed wood producing steady flames and safe energy efficient heating. 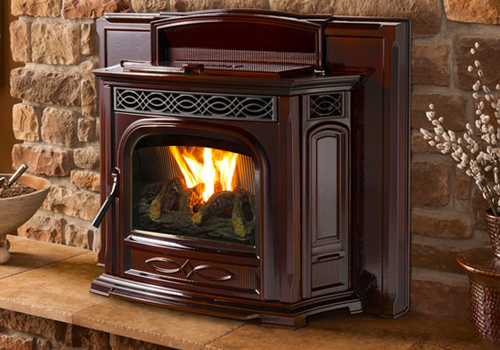 Pellet stoves are the best option for those who want increased efficiency and less maintenance while keeping a look of flames that is more realistic than gas. More energy efficient that wood-burning. Burns to look more like wood than gas fireplace inserts. Environmentally friendly. Pellet stoves emit the least amount of smoke. Safer than wood-burning stoves. No sparks or creosote deposit buildups that can cause house fires. After having your fireplace insert installed, it’s important to have your chimney and fireplace cleaned and inspected every year. Getting annual service ensure that your fireplace insert continues to operate safely and efficiently. If you schedule a maintenance visit, you can count on us to provide honest and insightful feedback regarding the performance of your current system. We can identify seemingly minor problems and use repair them quickly, thereby enhancing your fireplace’s efficiency and preventing costlier problems in the future. Find out more about our repairs here. If your fireplace fails to deliver the exceptional performance you desire, installing a fireplace insert installation could do the trick. The project doesn’t take long, but you’ll quickly notice the difference. All Pro Chimney Service can stop by to help you determine whether insert installation could improve your wood-burning fireplace’s performance. We can quickly determine the compatibility of your fireplace, and provide suggestions regarding the best insert for your aesthetic preferences and maintenance needs.